We left Amarillo, Texas on Tuesday March 31, heading East on I-40. 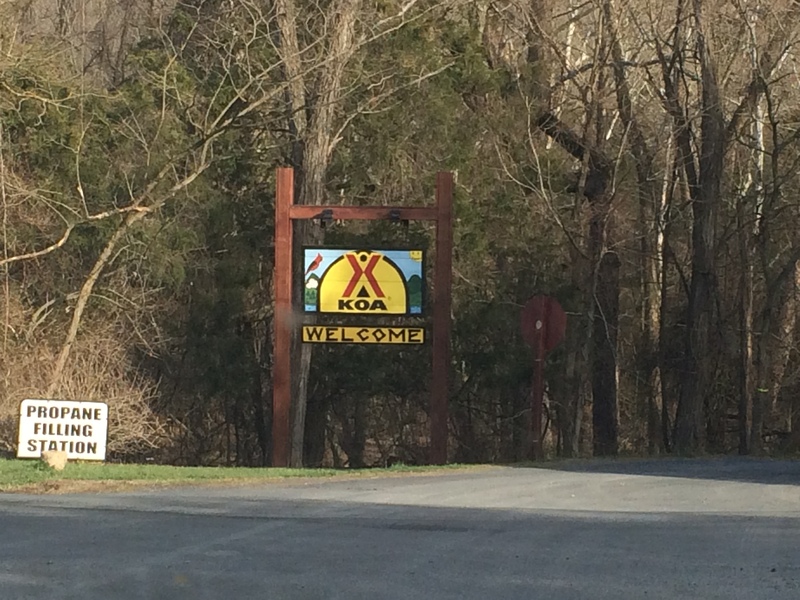 6 days and 1530 miles (2,400 KM) later, we pulled into Harrisonburg/Shenandoah Valley KOA in Broadway, VA. 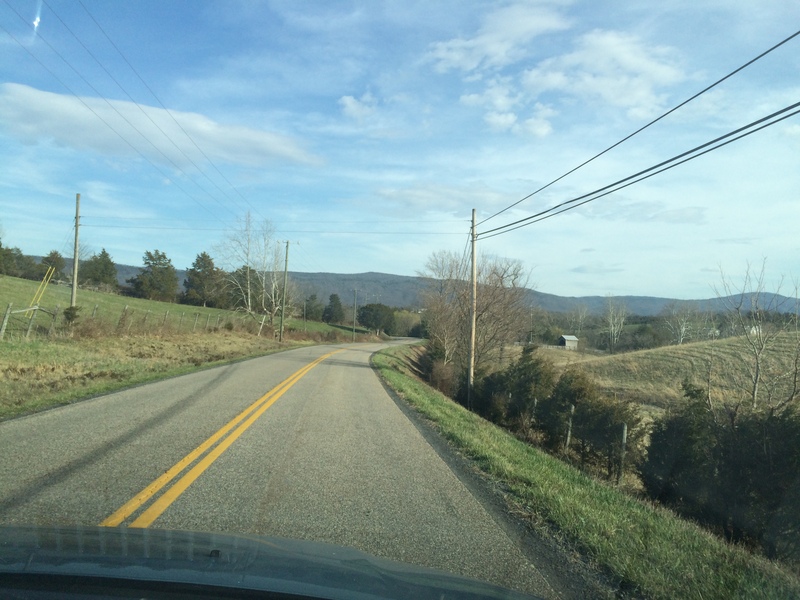 The last leg of the trip from Salem to Broadway, Virginia was a short one (130 miles/210 KM). We decided to grab breakfast rather than fix something. The Omelet Shoppe sounded pretty good so that is where we headed. The restaurant looks like a converted Waffle House. Food was OK but nothing to write home about. I-81 traffic was pretty heavy this morning. It was moving but sometimes at a slow pace. 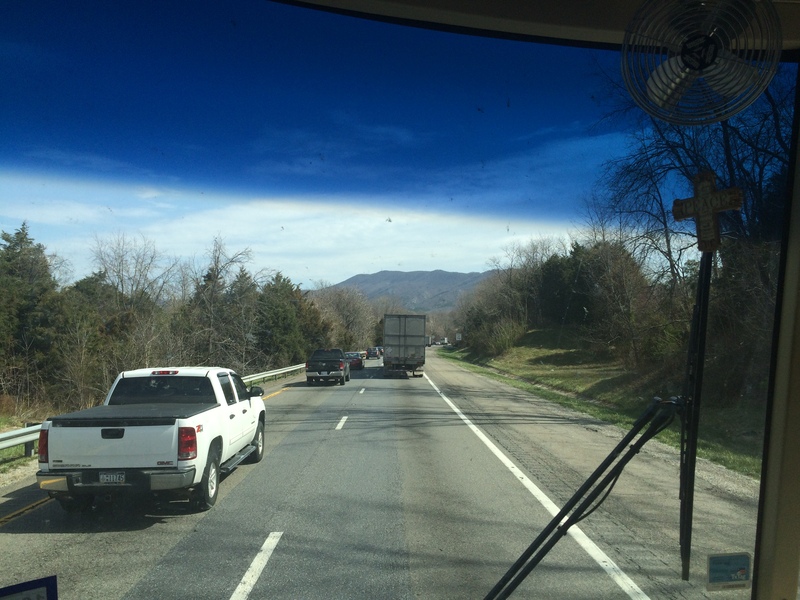 For our last segment of the trip, we, turned off I-81 and are now on Route 608 (Mauzy-Athlone Rd). After about 4 miles (6.4 KM) of a winding two lane road, passing a few dairy farms and a turkey farm, we arrived at the entrance to our new home. After exchanging greetings and filling our motor home’s propane tank, we backed into our site and started getting our site set up. We made good time on our 1530 miles (2,400KM) trip. Yes, we endured a couple of big storms along the way and one obstacle on the highway in Memphis, but overall, we had a good trip. It is not unusual to see an RVer broken down on the highway or worse, an RVer involved in an accident. On this trip, we saw neither. We enjoyed the company of good friends in Bluff City, Tennessee and had great food in several places especially Blues City Cafe in Memphis. It was sad leaving our friends behind in Amarillo, Texas but it is good to have a chance to meet new friends in our new location. We have a fantastic site and look forward to many campfires. Tomorrow I will post more photos of our campground. Thanks for stopping by, y’all come see us now. This entry was posted in Tennessee, Texas, Travel, Virginia and tagged Amarillo, Blues City Cafe, Bluff City, Broadway, Harrisonburg/Shenandoah KOA, Memphis, Omlete House. Bookmark the permalink. Yes, Carol. We are workamping here for the next 12 months. I am the maintenance manager and my Carol is working part time in the office taking care of registration. Cody looks very comfy in his spot in the RV. Is Cody a good traveler? Bethie, Cody sleeps like a log when we travel. Our Chineese Crested, MeiLing, is as tight as a drum when we travel. She has learned that laying next to Cody soothes her. Love your guard dog. 🙂 How long will you be in this spot? Judy, We will be here for a year. This gives us plenty of time to explore and perhaps move on up to New England next Spring. What a wonderful life you lead. I love listening and following you on your trails! Thank you, Claudia. We enjoy what we do because it gives us a chance to live in different parts of the USA. While we would love to live in ‘vacation’ mode, that is not practical for us. 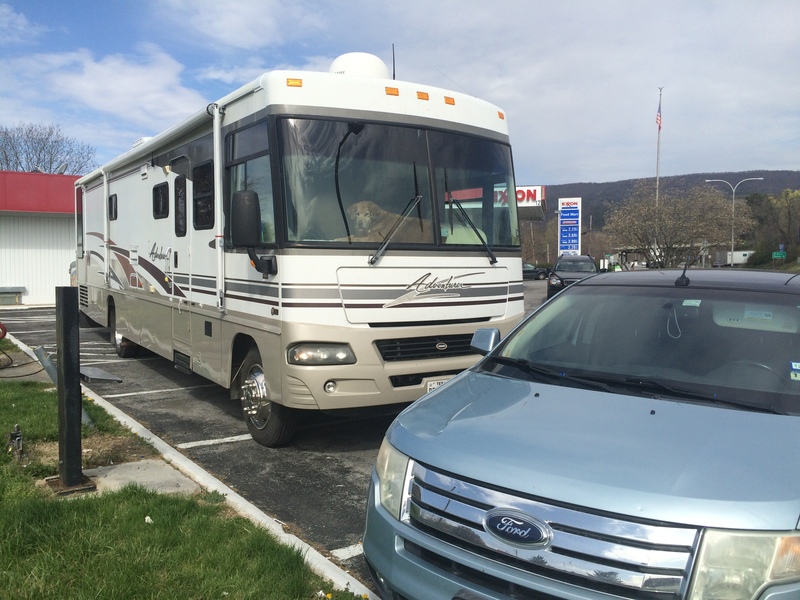 So we opt to park our RV in spots that allow us to explore the local area. 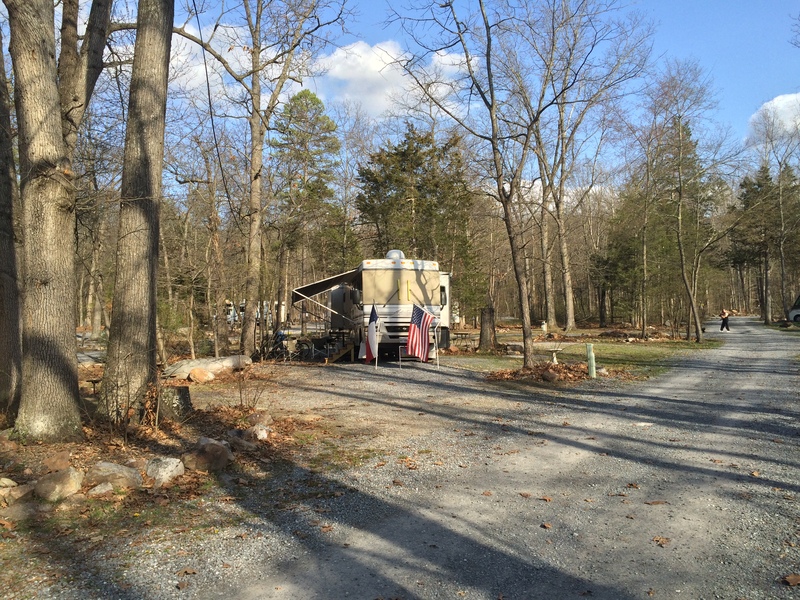 We work in RV parks to supplement our social security income. It may not be ideal for some, but it works for us. I am glad you enjoy our trip. Glad you are safe and sound. So a new place to call home. Is it a bit colder then what you were use to in Texas? Looking forward to see your photos. I have just gotten back from our journey into Utah. It was incredible! It is good to be settled once again Nancy. Yes, it is a bit cooler up here. Amarillo temperatures were starting the heat up. We are in the 40’s in the morning and 60’s and 70’s during the day. That suits me just fine. One of these days we will get out west. You will love it… but in the winter months! Nancy, we are not afraid of winter. Our time in Amarillo, Texas brought us snow, cold an lots of wind. We had temperatures in teens and single digits. At least here in the Shenandoah Valley, the wind should not be a factor. Hopefully.